All fire pits need some sort of a firewood grate. You'll need to raise the firewood off of the floor of the fire pit so air can circulate and you get the firewood out of the ashes. This grate is one heavy duty grate. It's 36" in diameter and we can make it as tall as you need. When I say 36" diameter this is the foot print of the grate with the legs on the outside of the circle. The circle is actually 29" in diameter. 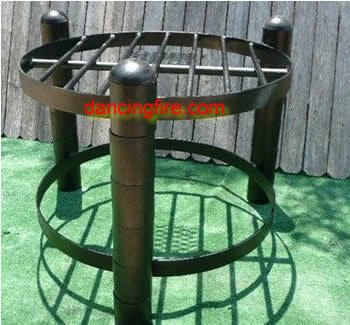 The grate pictured here is 24" tall but can be adjusted down in four inch increments all the way to four inches off the floor. The legs are made of 3 1/2" pipe. The grate pictured here weights in at 150 pounds. This grate is available in different heights. From 8" tall to 32" tall. Remember you can adjust the grate down. So get the grate as tall as possible. 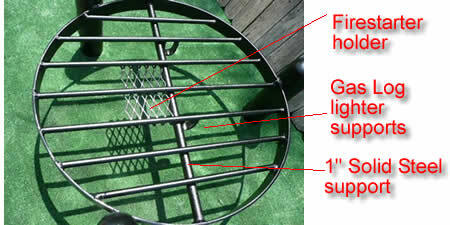 All grate measurements are measurements of the actual footprint of the grate not the screen size of the grate. 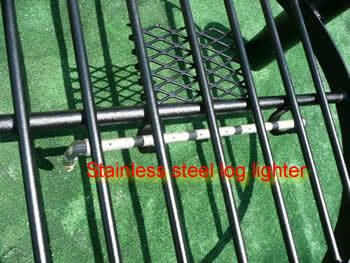 So each leg is 3.75" x 2 + what size the diameter of the grate. What this means is a 36" grate is measured from the outside of the legs and will fit in a 40" hole.